Posted May 12th, 2011 at 2:00 pm. Wood’s research proposal deals with improving the efficiency of sparse-matrix computations, which are used in computer applications ranging from scientific simulations of fluid dynamics to commercial search engines. 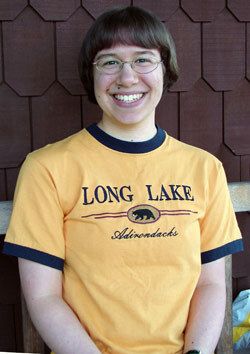 Wood is enthusiastic not only about her research plans, but about the opportunity to serve as a mentor to other aspiring computer scientists. Wood has taken full advantage of the collegial relationship among the computer science departments in the Tri-College consortium of Bryn Mawr, Haverford, and Swarthmore, taking her first computer course at Bryn Mawr, doing research in a Swarthmore professor’s lab, and majoring at Haverford. She cites summer research opportunities provided by the Computing Research Association’s Committee on the Status of Women in Computing as a critical factor in her decision to pursue a Ph.D. in computer science. Through this and subsequent research projects, Wood discovered the value of perseverance—and also the vital role that “patient and encouraging mentors” play in fostering the confidence required to persevere. The encouragement that she received from her mentors inspired her to provide the same kind of benefit for others, especially women, who are severely underrepresented in computer science. She has already begun to do this as a teaching assistant in the Bryn Mawr and Haverford Computer Science Departments.